The acquisitions and disposals team at Vail Williams was appointed by leading industrial and warehouse developers, Chancerygate, to advise on the development and marketing of a brand new facility at Pioneer Park, Portsmouth. Based on Portsmouth’s premier industrial hub at the Airport Industrial Estate, the development was the first post-recession speculative industrial development in Portsmouth. The multi-million industrial and warehouse development spans 75,000 sq. ft. and is made up of 8 units ranging from 4,759-23,181 sq ft.
Having advised on the initial sale of the land at Pioneer Park, Vail Williams was appointed by Chancerygate, and subsequently Barings Capital, to advise in relation to market and rental demand to support the development. Drawing upon experts from across our acquisitions and disposals, lease advisory, property valuations and business rates teams, we also advised on the building specification, and secured a number of pre-lets and pre-sales through its targeted marketing campaign. The project was instigated by Chancerygate and subsequently sold to Barings Capital, at a difficult time for the property market, following the recession. Portsmouth was suffering from a chronic lack of investment in industrial and warehouse stock, but following an in-depth market report from Vail Williams, both Chancerygate and Barings were confident in Portsmouth as a place to do business. Taking on board the market insight provided by Vail Williams, they chose to press ahead with the development, which opened in May 2017. 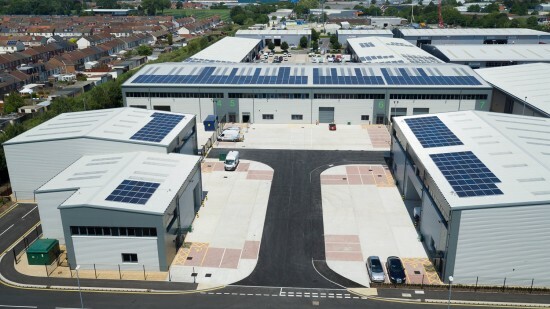 The facility has been dubbed a best-in-class for its build quality, with a discounted renewable energy supply from solar PV panels, full height electric loading doors, mezzanine floors, fully fitted offices and the highest possible environmental credentials. Thanks to the expert knowledge of the Portsmouth market by the team at Vail Williams, the development was completed to specification and was 30% pre-let before opening in May. Just two months following the opening of the facility, it is now 50% let to Bishops Move, Carillion Industrial Services and nationwide distributor of insulation and interior building products, CCF. The confidence that Chancerygate and Barings showed in this speculative project, and in the Portsmouth area in general, proved to be well founded, giving the south coast a fantastic and much needed industrial facility that is already in high demand. Graham Barker, Managing Director – UK Asset Management at Barings Real Estate: “When we first embarked on the project, there had been a chronic lack of industrial stock due to rapid take-up after the recession. “However, we knew that there was demand for this type of industrial and warehouse space and we were confident in Portsmouth as an area in which to do business. The subsequent success of this project has really proven that.